# Boil the mixture of sugar and water. When the mixture reaches to the boiling temperature, add lemon juice into the mixture. Boil it for about 5-10 more minutes. Then, remove the pot from the stove and let it cool down. # Melt the butter and let it cool down. Then, pour it into mixing bowl. # Add olive oil, milk, egg and egg white on it, and mix it. Add the sodium bicarbonate, which is mixed with some flour, and add salt into the mixture. # Add flour into the mixture little by little, until the dough stops sticking to your hands, during the kneading. Rest the dough for 20 minutes. 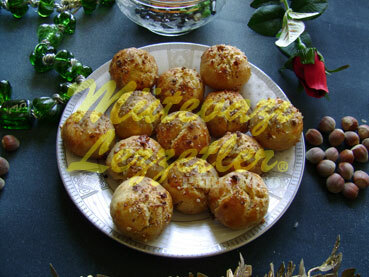 # At the end of the resting time, pick walnut sized pieces from the dough and roll them. Place them onto the greased baking tray. # Spread yolk all over the pastries. Place hazelnuts on them. # Place the tray into the oven, which is preheated to 356 F. Bake them until the pastries turn into red. # Rest them for 5 minutes, after removing them from the oven. Then, pour the cold syrup all over the pastries. Note: It is advised to use “Breakfast Type” butter for cooking Palace Dessert.